Plus, Oakland Alex Lewin tells you how to make your own fermented beverages in Kombucha, Kefir, and Beyond. The world is about to fall in love with Preeti Mistry. In Oakland, we’ve already seen her in the kitchen and tasted her food and felt the importance of her work. But for folks who live elsewhere, The Juhu Beach Club Cookbook will likely be their first real dose of Mistry magic. The cookbook, authored with local food writer Sarah Henry, arrives Oct. 31 via Running Press. Like its namesake restaurant, the book is full of charm, hot pink, and unexpected twists. Of course, recipes for all of Juhu Beach Club’s classics are there, too: vada pav, doswaffle, and, yes, Manchurian cauliflower. But this is also very much a book about Mistry herself. It’s the story of how a London-born, Ohio-raised, Indian-American kid grew to love her culture through food and found home in Oakland. It’s how the unique vision and flavors at Juhu Beach Club came to be. Mistry dives into biases and inequities in the food world in a smart, personal way. She also spells out exactly what she’s doing at Juhu for any diners who don’t quite get it: “I’m trying to educate people that non-European cuisine can also be elevated and innovative,” she writes. And, yeah, she does talk about that time on Top Chef. The format reads similarly to Roy Choi’s part-memoir, part-cookbook L.A. Son, with narrative chapters followed by recipes that thematically fit those anecdotes — plus big, glorious photography worthy of a coffee table. Reading it cover-to-cover, it totally works. As an easy-to-reference utility — well, there’s an index. There is something very bittersweet about reading The Juhu Beach Club Cookbook right now, knowing that the restaurant’s current iteration in Temescal is coming to an end. The pages explode with love for the restaurant, neighborhood, and community, and it’s a delight to see so many shout-outs to Bay Area chefs, farmers, and other personalities. Will the next Juhu Beach Club have such a beautiful story? Can it possibly? Let’s hope so. If Oakland resident Alex Lewin had his way, we’d all be drinking kimchi punch for breakfast every day. 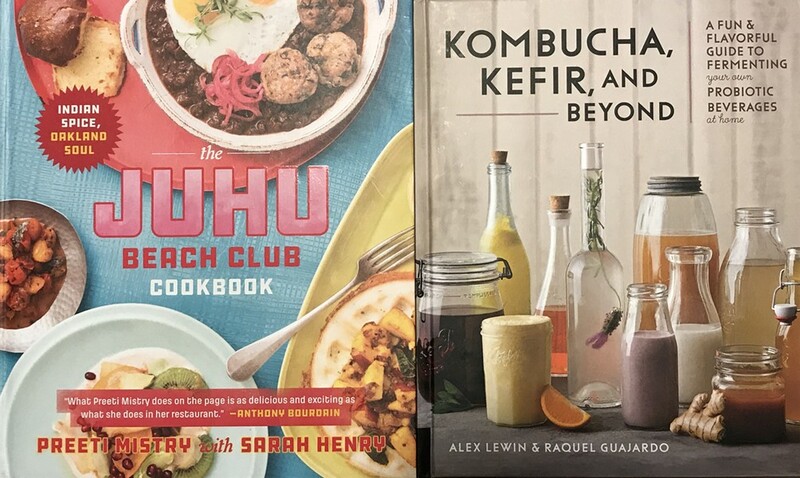 I’m exaggerating, I think, but Lewin and Raquel Guajardo present a compelling argument for why we should all be drinking fermented beverages in their new book, Kombucha, Kefir, and Beyond: A Fun and Flavorful Guide to Making Your Own Probiotic Beverages (Fair Winds Press). We’ve all heard about the health benefits before, but Lewin, a Harvard grad who travels the world teaching fermentation classes, hammers down the scientific evidence. Even better, he and Guajardo make the process seem fairly simple. There are recipes for kombucha, kefir, root beer, homemade wine, as well as more old-timey concoctions such as kvass, switchel, and mead. There’s even a recipe for prison wine, partially made in a plastic bag. school she runs in Mexico, and they dreamt up this book over glasses of pulque.